No Two Alike. Karl Blossfeldt, Francis Bruguière, Thomas Ruff. Text by Anne McCauley and Edward Juler and Kevin Moore and Ulrike Meyer Stump. Verlag für moderne Kunst, 2018. 160 pp., 57 illustrations, 9x12". No Two Alike documents an exhibition curated by Ulrike Meyer Stump as part of Cincinnati's 2018 FotoFocus Biennial, with its general theme 'Open Archive.' The exhibition restages the historic encounter between Karl Blossfeldt’s plant photographs and Francis Bruguière’s light designs held at the Warren Gallery in London in 1929 and juxtaposes it with the Photograms and Negatives series by contemporary artist Thomas Ruff. The combination of Blossfeldt's biomorphism and Bruguière's abstraction offers clues for the understanding of British modernism, and offers insight into the role photography and photobooks played in the British avant-garde. Throughout his career, Thomas Ruff has expressed great interest in the history of photography and has repeatedly shown a special affinity with Blossfeldt (particularly in his Negatives series); Bruguière's abstract light compositions, on the other hand, have strong formal ties to Ruff's photograms. 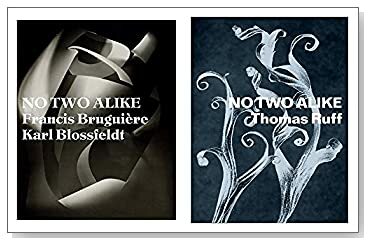 'No two alike' expresses the three artists' mutual interest in the variant as a creative principle, also advancing the idea that each of these bodies of work presents a variant of the other.